Saulot is dead destroyed by the foul Usurper. Everywhere the servants of the Tremere hound the remaining Salubri, condemning them to the pyre or the stake. And while the land cries out for a healers touch, it is only by turning to the sword that the Salubri can survive. 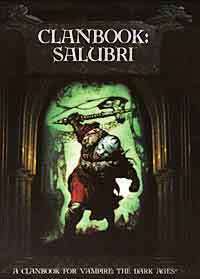 In the last solo Clanbook for Vampire: The Dark Ages, the secrets of the reclusive Salubri are revealed. How can they strike back at the Tremere Usurpers? What powers can they bring to bear in their own defense? What secrets do they carry that allow them even the hope of survival? And why do the other clans turn away from their plight? The answers to these questions and more await.